DELTAKOMPAKT is a borne version of compactors offered by N.O.P.O.Z.M., Ltd. This machine combines all the advantages of the compactor.That is means five consecutive working bodies, which can be modified differently according to the customer´s wish. This compactor which does not have its own chassis has higher demands on the lifting force of the tractor. This machine is prefed by customers with smaller areas of land for its easy maneuverability and lower price. Front-mounted compactor Deltakompakt is designed to maximize tensile strength of the energy resource. 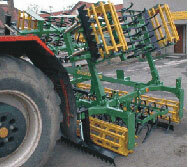 As shown in the picture could be used for example as the first operation before the sowing combination. After such processing a tractor with seeder combination of higher operating speed and at the same time there is less stress on organs of sowing combination. The front axle ot the tractor is also more weighted.